Wormser, Kiely, Galef & Jacobs LLP is a broadly based general practice law firm with offices in New York City. Our focus is on providing quality legal services to our clients in a wide range of practice areas including alcoholic beverage and hospitality industry law, banking, civil litigation, construction law, commercial and contract law, corporate law, immigration and nationality law, international law, real estate, taxation, and trusts and estates. The firm has a large and varied clientele embracing a cross section of commerce and industry, as well as individuals. The firm's clients include business corporations, banks, partnerships, individuals and governmental agencies and entities, trusts and estates, as well as not-for-profit organizations. Wormser, Kiely, Galef & Jacobs LLP prides itself on offering its clients quality comprehensive legal solutions and personalized attention in a cost effective, responsive, and timely manner. We offer a comprehensive range of immigration services. We represent foreign and domestic corporations as well as individuals in connection with temporary work visas and permanent residency based upon employment and family relationships. Our clients include, among others, multinational companies, law firms, the entertainment community, foreign investors, athletes, the restaurant and hospitality services industry, internet service companies, and businesses in the beverage, financial, journalism, recreation, consumer products, agribusiness, publishing, chemical, energy, construction and manufacturing industries. We also handle citizenship and related nationality matters. Legal Disclaimer: The immigration-related content appearing and archived on WKGJ's website is provided as a public resource of general and historical information. It is not intended to be acted upon nor to be considered legal advice, or in any way to invite or create an attorney-client relationship. WKGJ expressly disclaims any and all liability with regard to actions taken or not taken based upon any content contained on the firm's website. In addition, links to other entities appearing in our immigration newsletters and newsflashes are provided for informational purposes only. WKGJ takes no responsibility for the content or accuracy of information contained on any such sites to which content is linked. Mr. Azzinari joined the firm in 1991 and became a partner on January 1, 2001. He concentrates primarily in the area of commercial and contract law, including the negotiation and preparation of design/build and other construction contracts for large industrial facilities, as well as related subcontracts and other agreements governing matters such as technology licensing and consortiums. 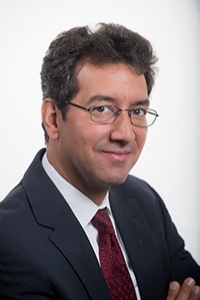 Mr. Azzinari also practices in the areas of litigation and arbitration of commercial and construction disputes, and has conducted or been involved in trials and proceedings before the federal and state courts of New York, the International Court of Arbitration, the American Arbitration Association and JAMS. In the litigation area, he often supervises local counsel in other jurisdictions.